Entering the gallery, you faced the monumental Red Lightning(2008–10, acrylic on canvas, 97 by 146 inches). Its dynamic composition, red-pink-violet-blue harmonies and sumptuous materiality are engaging in themselves. The sky scene is infused with drama and recalls, all at once, Guston, Rothko, Nolde and Turner. 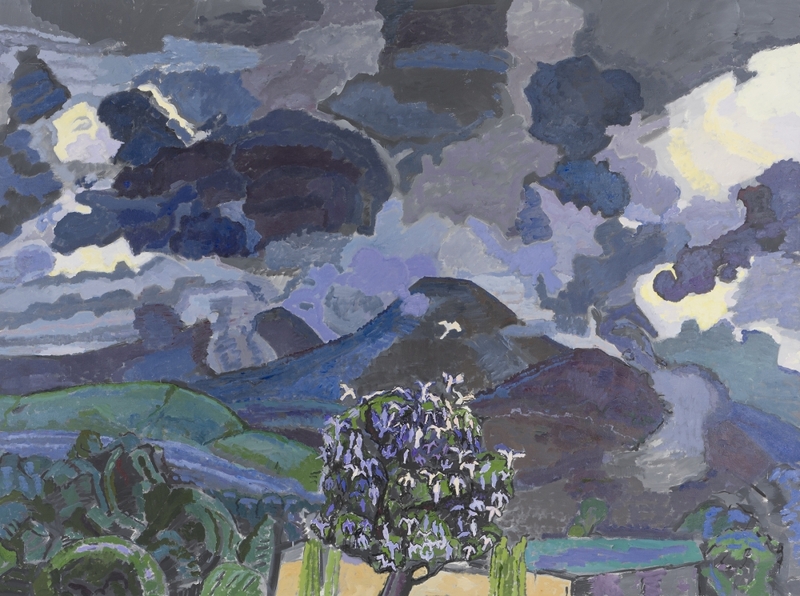 The early skyscapes, which include landscape and architectural elements, reveal the young Nickson focusing skillfully on strategies: color combinations, shape (clouds enliven and balance) and buoyant responses to art history. Yet the paintings’ surfaces, light and color are too flat to convey the physical or metaphorical expansiveness of skies. Powerful images and masterful execution characterize the show’s relatively recent watercolors. All 15 “Monumental Trees” (1999–2000, 18 by 24 inches each) are based on the same maple, yet each is distinct. The marks of one suggest van Gogh’s drawings; another has an allover quality. Yet another looks like it’s composed of dragons. Twelve slightly larger and later watercolor skyscapes painted in Italy and Australia succeed as near-abstractions. Nickson’s pictorial organization and lyrical color stains allow him to pull off several unabashed depictions of glowing round suns and rainbow rays. In Tree of Birds (2011, acrylic on canvas, 108 by 144 inches), he risks a compendium of clichés and delivers the culminating, unforgettable painting of the show. An active sky occupies half the picture. On an ocher, altarlike shape at the bottom edge sits a lush flowering tree filled with white birds; one soars toward a mountaintop in the picture’s middle. The painting is luminous: dominant blues, violets, grays and greens are lit by glimpses of yellow sunlight at the upper left and right and by the ocher beneath the tree. Together those warm colors form a triangle, counterbalancing the bird in flight. Every inch of the canvas is animated and alive. It’s a risky big picture in form and content, a metaphor for art and life.